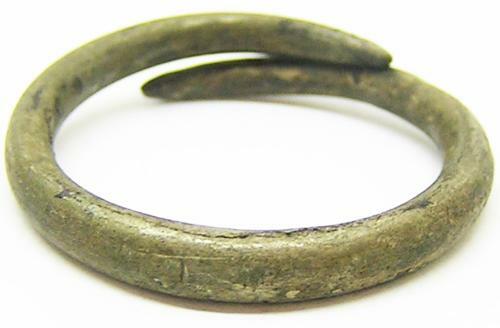 This is a nice Iron Age -Saxon period base silver finger ring, dating to c. 500 B.C. - 500 A.D. The simplicity of the design makes such a piece hard to date, they have been recorded as being in use from the pre-Roman - post-Roman periods in Scandinavia. A similarly shaped ring in gold was found in Sweden, dated to the 4th century A.D. (see here). Other examples to the Saxon period have been recorded SF-93DDE8, SF-07FB63, HAMP-98BD96 etc.